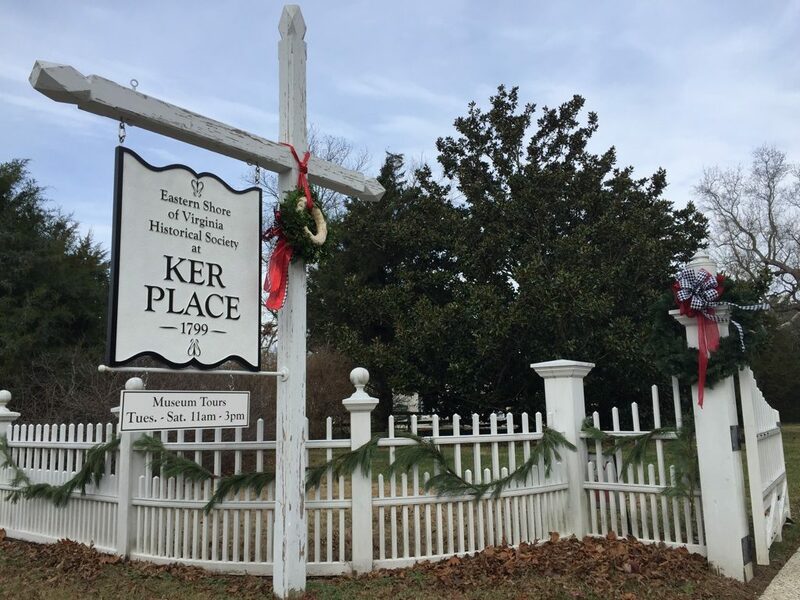 A weekend of holiday festivities in historic, waterfront Onancock, VA, is highlighted by a rare opportunity to visit six private homes – some built in the early 1800s – situated on Onancock Creek and decorated for the holidays. The 19th annual Onancock Christmas Homes Tour will be held from 1-5 p.m. on December 8, 2018. Onancock, chartered in 1680, is one of the oldest towns in Virginia. Historic Cokesbury Church hosts the free, 19th annual music festival the same day, with a variety of performances and Christmas carols. Wesley, an 1809 Federal-style house, with 12-foot ceilings, heart pine floors, and six fireplaces, one of which is inlaid with reeds from Onancock Creek. The house was named for John Wesley, founder of Methodism. Methodist Church meetings were held here until 1821, at which time plans were made to build Cokesbury Church in Onancock. Cokesbury, originally called Poulson Place, featuring a massive cooking fireplace in the kitchen and a little schoolhouse, operated by the Poulsons in the early 1900s. The original section was built in 1806, the next section added in the early 1870s, and the final addition built in the early 1950s. During the Civil War, a Union Army detachment camped in the fields in front of the house for several years. The Cove, a Victorian-era, Georgian style brick home parceled from the adjacent property, Cokesbury, in 1885 as a wedding present to Charlotte ‘Lottie’ Poulson. The current owners completed an addition in 2010. The house features antiques, crocks, decoys and reproduction furniture pieces made by the owners, as well as a carousel horse – from the Onancock carnival – manufactured by the Allan Herschell Company. The Minton House, a picturesque, Federal-style home, reached by a winding driveway through tall pine trees. The house was built in 2005. The entry hall has a large staircase and features a hand-painted mural by local artisan Miriam Riggs. Handcrafted items, art and many works by Eastern Shore artisans are displayed throughout the home. South-facing windows offer glimpses of manicured gardens and a birds-eye view of Onancock Wharf. Heartsworth Cottage, built on grounds that are full of history, including the Poulson Point Cemetery with markers dating back to 1759. A portion of the house comprises an old cook’s kitchen moved from a nearby farm. The peaceful retreat features a wall of glass doors leading to a spacious deck offering magnificent views of Onancock Creek. Westwil Cottage, designed and built in 2012 for the owners’ senior years, a low-maintenance, brick home with extra-thick exterior walls, energy-efficient heating/air systems and eco-foam insulation. The concept of simplicity extends into the landscaping, which uses a natural turf yard and perennial and native plantings whenever possible. The outdoor living area features a pergola, grill area, herb and vegetable gardens, and an orchid greenhouse. The holiday weekend kicks off Thursday, December 6 with a free showing of “Miracle on 34th Street” at Onancock’s historic movie theater. Below is a list of events including Santa’s arrival by boat, an Artisans Market, and an old-fashioned Christmas Parade. Throughout the weekend, shop for unique, Eastern Shore-made gifts and dine at the town’s many restaurants. The Homes Tour benefits the Citizens for a Better Eastern Shore. Additional information published at www.onancock.org/Events. Questions: 757.710.6353. Galleries, Shopping, Wine Tasting Beginning 4 p.m.
Santa Comes to Town by Boat 11 a.m. FREE. Reindeers in kayaks lead Santa into town wharf. 19th Annual Cokesbury Christmas Music Festival 2-6 p.m. FREE. Historic Cokesbury Church. Musical performances, Christmas carols. Drop in throughout the day.